Feb 6 It’s All About Mickey at Magic Kingdom in 2019! A couple of months ago, I had the privilege of appearing on my friend’s podcast, Detour to Neverland, to talk about – among other things – this blog, my Disney-focused Instagram account (@wdwpaparazzi), and my love of all things Disney, particularly the theme park experiences I routinely share in this space. The conversation turned into the broad range of experiences Walt Disney World has to offer. No matter your tastes or interests, there is something for everyone to enjoy. Brendan, the host, then made the comment, “it’s more than just standing in line to meet Mickey Mouse.” I chuckled…but then quickly agreed. The point he was trying to make – and it was a good one – is that people don’t fully understand or are even aware of all Disney World has to offer. And their perception of it is often misguided and off base: that Disney is just for “kids.” And there is so much more to it than that. The Epcot International Festival of the Arts happening right now, for instance, is a great example. But all that being said, allow me to let you in on a little secret, friends – it kind of is about that! As Walt Disney himself famously said, “I only hope that we don't lose sight of one thing - that it was all started by a mouse.” And truth be told, Mickey Mouse is and always will be the star of the show, the main attraction. Regardless of your age, there is something so incredibly special and almost surreal about meeting Mickey Mouse. Giving him a high-five or a hug and allowing yourself to truly believe in the magic of it all. When I was in college, I once heard in a visual communications class, that the Mickey ears is the most recognized symbol or logo in the world. I don’t know if that is true, and since this is a blog and not a research paper, I won’t even bother to look it up…but the point is, everywhere around the world, Mickey is universally loved by children and adults alike. So, if you are as big a fan of the Big Cheese as me (and again, based on the above, how could you not be? ), then I have good news for you! This year at Disney parks around the world, including Walt Disney World in Orlando, it’s all about the Mouse. You see, Mickey turned 90 years old on November 18 – commemorating the day Steamboat Willie made its debut in 1928, quickly catapulting both Mickey and Walt into the spotlight. I was fortunate enough to be at the Magic Kingdom that day and had the honor to wish Mickey a happy birthday in person (aren’t these pics adorable?). It’s a memory that my children and I will never forget. But, in true Disney fashion, why celebrate just one day when you can celebrate all year? So that’s what Disney is doing – turning all of 2019 into one year-long celebration of all things Mickey (and Minnie too – can’t leave her out!)! I had a chance to check out some of the festivities this past weekend, and oh boy (said in a Mickey voice), are they fun! Here are a few of the highlights. The Move It! Shake It! MousekeDance It! Street Party has replaced the former Move it! Shake It! Dance and Play It! Street Party. While largely the same concept, the previous version featured somewhat of a random mix of Disney characters parading and dancing down Main Street, USA (such as the Toy Story gang, Genie from Aladdin, Stitch, Zootopia characters, etc.). The new Mickey and Minnie-themed parade/dance party is all about Disney’s first couple and features the entire “Mickey and Friends” crew such as Goofy, Donald, Chip and Dale, and even some more “obscure” friends like Max Goof (Goofy’s son) Clarabelle Cow (who gave me a loving gaze this weekend as you can see in this pic)! And of course, Mickey and Minnie are appearing in their festive and colorful “celebration” outfits. It runs several times a day and is a ton of fun. The all new Mickey and Minnie Town Square Theatre Meet and Greet: Speaking of celebration outfits, also new for 2019 is the chance to meet Mickey and Minnie in their birthday costumes at the Town Square Theatre right at park entrance. 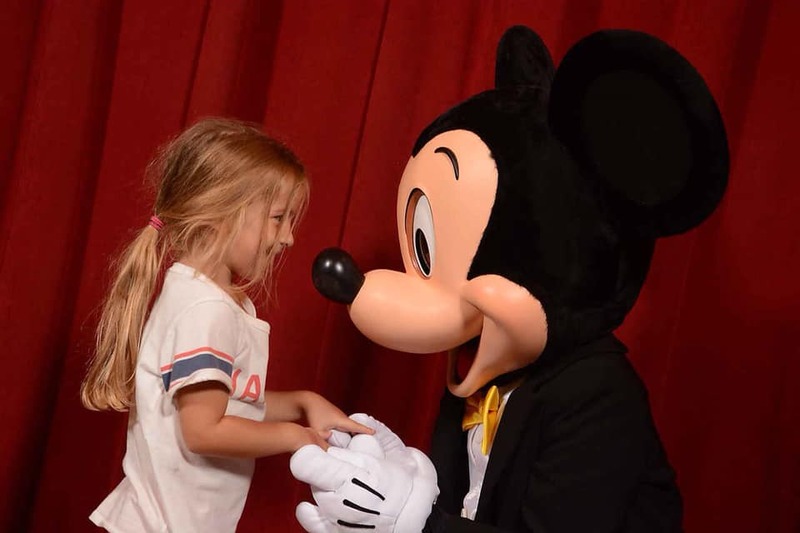 Formerly home to just a Mickey meet and greet (which up until last May featured the “talking Mickey”), guests can join the celebration by posing for a picture and sharing a laugh (and getting in a much-needed aforementioned hug or high-five) with Mickey and Minnie. Like the new dance party, this attraction just opened on Jan. 18 so wait times are still high and it’s quickly become one of the hottest Fast Pass options around. But it’s totally worth the wait (or use of a Fast Pass). Quick side note, now that Minnie is appearing alongside Mickey in Town Square Theatre, the former Minnie meet and greet at Storybook Circus in Fantasyland has been replaced by Pluto. The Merchandise: If there is anything Disney does right (and they do many things right), it’s the merch. Celebration items include everything from shirts to hats to pins to these adorable Mickey plush figures. And yes, I bought three of them on Saturday (for the kids of course)…because one can never have too many Mickey plushes. So, if your travels bring you to Walt Disney World in 2019, make sure your plans include a trip to the Magic Kingdom to celebrate 90 years of Mickey and Minnie magic. These events will be happening through September. (In upcoming blogs, I will share additional highlights of what’s new for 2019). And if you can’t make it to Walt Disney World this year, fear not. You can celebrate Mickey Mouse anywhere you go. For instance, the famed Mickey Premium Ice Cream bars that have historically only been offered at Disney Parks, are starting to appear in grocery stores - so keep an eye out. And the Mickey 90 merchandise that debuted at Target last year and other retailers can still be found in stores. And of course, you can always check out my Instagram for your daily dose (sometimes more) of Disney magic from my frequent park visits. Hope to ‘see ya real soon’ at Magic Kingdom! Oct 9 ‘You’ve Got a Friend in Me’ at Toy Story Land at Hollywood Studios!